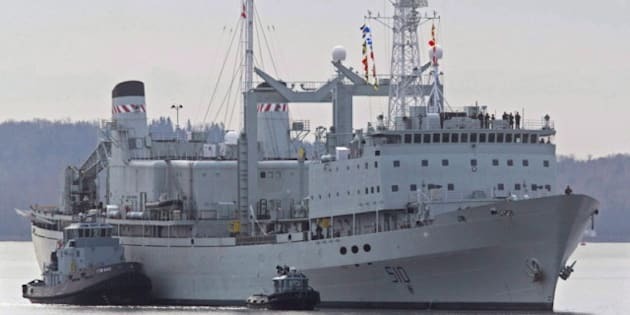 The navy spent nearly half a million dollars to repair a supply ship that rammed into a dry dock in Halifax harbour last November. Documents obtained by CBC News reveal the collision occurred during the ship's first cruise following a $45-million refit. The Navy has been tight-lipped about the incident. HCMS Preserver is the largest ship in Canada's East Coast fleet. At the time, it was under the control of its new Commander, Larry Jones. This was the first time Jones had taken the ship from the dock. The documents reveal HMCS Preserver stopped responding to the helm in the middle of Halifax harbour. Jones couldn't get the ship to turn. The report describes the tense moments that followed. It says the ship tried to turn in the narrows, but the tide kept pushing it the wrong way. The main engine was stopped and orders were given to reverse. Another order called for the ship to go in full reverse. Then the ship's crew were told to brace for a shock. Two minutes later, HMCS Preserver slammed into a floating dock. No sailors were injured in the incident. The ship didn't take on water but it did sustain damage, mostly to the bow section. The final repair bill to the bow is $497,442.34. The cost of the damage to the floating dock has not been released. Jones was relieved of his command in March and assigned to an onshore desk job. At the time, the navy said there was "enough evidence for the navy to lose confidence in his ability to command at sea." The ship was repaired and began sea trials in March. This was the second serious collision for the Navy in just six months. The submarine HMCS Corner Brook ran aground off British Columbia in June 2011, ripping open the bow. The navy has not responded to CBC News requests to release documents revealing the extent of the damage to Corner Brook.